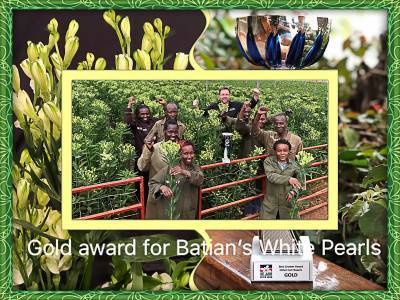 Located on the slopes of Mount Kenya, Batian Flowers Ltd. is well-known for producing incredible beautiful alstroemeria, florinca, roses, garden and scented roses of unparalleled quality. We are proud of our products, our reputation and the way we care for our employees and the environment. From our farm we supply the world with Kenyan alstroemeria, florinca, roses, garden and scented roses of the highest quality. To purchase Batian alstroemeria, roses and florinca please contact our office in Dubai. This website will give you an insight of our company, our staff and, of course not to forget, the incredible varieties of flowers we are growing. Because of our unique location on the slopes of Mount Kenya, passion, knowledge of flowers and our determination, we produce a quality of flowers we believe in. Have a look and contact us to experience the flowers yourself. To view the varieties we are growing and pictures of our farm please have a further look at our productpage. Upendo Flowers are doing all of Batian's marketing. Upendo Flowers is based in Dubai and are the distributors of our flowers to the whole world. We are proud to present a video of our farm which will give you a better insight of our operation and as well our way of working. By clicking this link you will be redirected to the video, so enjoy our company presentation and contact us if you should have any questions or requests.